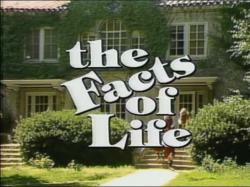 THE FACTS OF LIFE SEASONS. THE SHOW AIRED FROM AUGUST 1979 TO MAY 1988 ON NBC. THE FACTS OF LIFE STARRED CHARLOTTE RAE (MS GARRETT), LISA WHELCHEL (BLAIR WARNER), KIM FIELDS (DOROTHY "TOOTIE" RAMSEY), MINDY COHN (NATALIE GREEN), NANCY MCKEON (JO POLNIACZEK), & MANY MORE.